Candidates who want to take admission in this college must register for the given entrance examinations on the official websites of HB-SAT / CAT / XAT / MAT / CMAT / NMAT / JEE Mains / GATE. 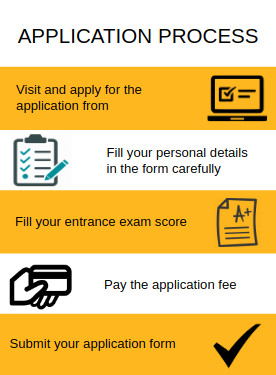 Visit the official college website to apply. Candidates can also obtain the application form for GAT by requesting it by post along with a DD of INR 150 in favor of GITAM University, payable at Vishakhapatnam. Fill the application forms carefully. Medical Certificate issued by a registered medical practitioner. 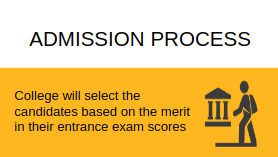 The admission process is based on marks secured in CAT/ XAT/ MAT/ GMAT/ CMAT/ GIM Online Test Entrance Examination. The selection will be done on the basis of their performance at the interview. Candidate must pass in 10+2 examination from a recognized central / state board or its equivalent with a minimum of 60% aggregate marks in Mathematics, Physics & Chemistry and first class or equivalent grade in the qualifying examination. Candidate must have atleast 50% aggregate marks in 10+2 or Intermediate from a recognized Board. Students must have qualified 10+2 examination with a minimum of 50% aggregate marks with Mathematics / Biology, Physics & Chemistry subjects. 1. The eligibility criteria are to be 12th pass. 2. I wrote GITAM entrance examination and got a seat in GITAM. 3. Exactly, I don't know about the typical cutoffs but it might be around 30 to 40. The eligibility criteria for this course is (pass outs of +2 or intermediate). Gitam has entrance test GAT and student are given the option to opt their course irrespective of taking the test. We would love to see the future UG students here for a better tomorrow. Test for admission is known as GAT, is the admission test or the entrance test to get a seat in the university. to get a seat in CSE or ECE we need to get at least 80 marks. The test is for 160 marks, 80 for maths, and 40 for physics and chemistry. The eligibility criteria for this course is that a student should get minimum 60% in 12th and should get a valid GAT. I appeared for GAT exam. The cut off generally depends on the performance of all students appearing for the exam. There were no particular criteria for my course but students have to appear for General Achievement Test (GAT) exam. After writing the exam if we are selected then we can choose our own course. The cutoff marks were 80 out of 300. GAT that is GITAM Aptitude Test is the test, candidates have to clear to get into GITAM University. According to marks and ranking secured, seats will be given for the candidates. The eligibility criteria are, the candidate should have an intermediate score of 850 and they should qualify GITAM GAT exam. Students are selected on the basis of GAT exam score. Anyone who has completed intermediate can apply here for admission also GAT entrance exam has to be clear. There is no cutoff. The eligibility criteria for my course was a minimum of 80% in 10+2 examination and also you should clear CAT entrance exam with a minimum of 50% in all subjects. The candidate must clear the GAT exam and must have passed the 12th from a recognized institute. Minimum 60% cutoff mark is required. A student should have 70% of marks in his/her 12th Board. One may also write GAT entrance test whose cutoff went to 70% of marks. We have a seperate entrance exam for any course in this University. We have an entrance exam called GAT for the admissions. GAT is the entrance exam to get the admission in this college. The cutoff is around 8,000. Candidate must clear the GAT exam to get admission in this college. I took direct admission. No entrance exam was required. how to apply for distance education in GITAM university? •Applications can be obtained in person by submitting DD for Rs. 200/- or by post requesting for application enclosing a DD for Rs. 250/- drawn in favor of ‘CDL-GITAM University’ payable at Hyderabad. •Send filled-in applications to the Director, Centre for Distance Learning, GITAM University, Hyderabad. Which is the entrance exam to be written to get admission in GITAM university? GITAM Admission Test (GAT) is the entrance exam to be answered to enter into GITAM university.